My goodness, I'm already to 5,000? It's barely been 6 months since the last one of these! In fact, I've barely published anything here since then, and almost everything that I have published was from Spring Break! I don't even know what I watched so much of to hit a thousand episodes so quickly. I guess finishing Inuyasha and Puchim@s! probably had something to do with it, but those only account for about a quarter. Ah well. I guess this just means that there has been a lot of good simulcasts lately. So, what's changed since the last one of these? Well, I finally subscribed to both Crunchyroll and Funimation. I was originally going to go with just Crunchyroll, but then Funimation decided that The Heroic Legend of Arslan would be a 3 week delay for free users and The Disappearance of Nagato Yuki-chan would be a 2 week delay, and I buckled. It was worth it though, since those shows are great. And now I get to watch more dubs if I so choose, which is fine by me. Side note: D-Frag! has a solid dub. This is no longer up to date, but the current one is always available at Anime-Planet. Are there any significant changes to my stats compared to the 4,000 episode mark? There's really only three things that I'll bother mentioning: my "watching" count has jumped from 7 to 17, my "dropped" count has... dropped, actually, from 8 to 4 (they live in the "stalled" category now), and my ratings histogram has crept even closer towards the normal distribution. In fact, the 4 star rating is now so popular that the 1.5 and 1 star ratings don't even show up on this scale. Thankfully, this also means that I haven't watched any horrible shows in the past 1,000 episodes either. I do like to think that I'm pretty good at avoiding trash. Oh, and I started reading manga, but that doesn't really factor into this discussion. Well, now that the recap is out of the way, I should probably start into what I promised in the title: how to deal with a large cast. Now, this isn't an "I have all the answers" type of article, since I most certainly do not. Instead, I'll be giving some examples of shows with large casts that I think get it right, and some examples that get it wrong too. I'll explain why I think they're worth mentioning and what they did that's notable. If you're looking for tips on how to manage a large cast for your own project, at the very least this article should give you some examples of shows with large casts that you can learn from on your own. There are two main problems that I see in shows with large casts, and they occur in two very different types of shows, though it's for fundamentally the same reason: episode count. Now, this isn't to say that everything can be boiled down to episode count, but I would argue that it's probably the single largest contributing factor. The two types of shows are long-running shows (100+ episodes) and standard-length shows (soft-cap of 26 episodes). Because these types so different from each other, for this article to make sense we're going to have to define what a "large cast" is differently for each. For long-running shows, a large cast is more than... oh, let's say 25 frequently recurring characters (characters that are integral in more than one story arc). For standard-length shows, a large cast is more than 10 semi-main characters (characters that receive nearly as much screen time as the main characters, even if they are clearly not the leads). Let's start out with standard-length shows, since their problem is the most obvious: a large cast with a small episode count means not enough time for everyone. Our two primary examples for this are Angel Beats! (done wrong) and The iDOLM@ASTER (done right). Now, these are not the same show; heck, they're not even the same genre. However, they do have a similar cast size, and in the grand scheme of things, their lengths are comparable. For our purposes, we'll be looking at only the series as it aired on television, meaning we'll cut out extra episodes released on dvd later (OVAs) as well as any movies. The goal here is to try and find how to make a tv series' character management satisfying, without relying on supplements released later. Thus, Angel Beats! is 13 episodes long, and The iDOLM@STER is 25. 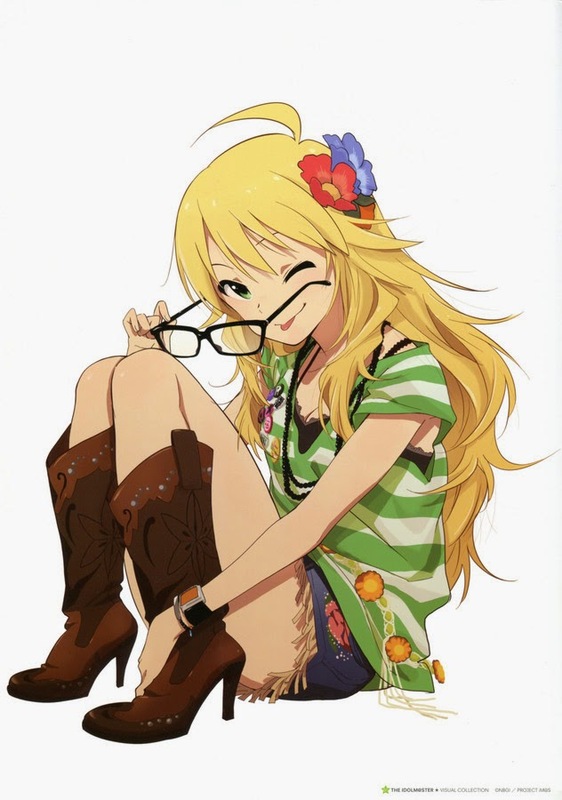 I was going to show a picture of the full cast of The iDOLM@STER, but then I remembered that Miki is best idol. So, how many characters does each series have to deal with? Well The iDOLM@STER has 16 main/semi-main characters to deal with, and Angel Beats! technically has 20. And that's really the problem. 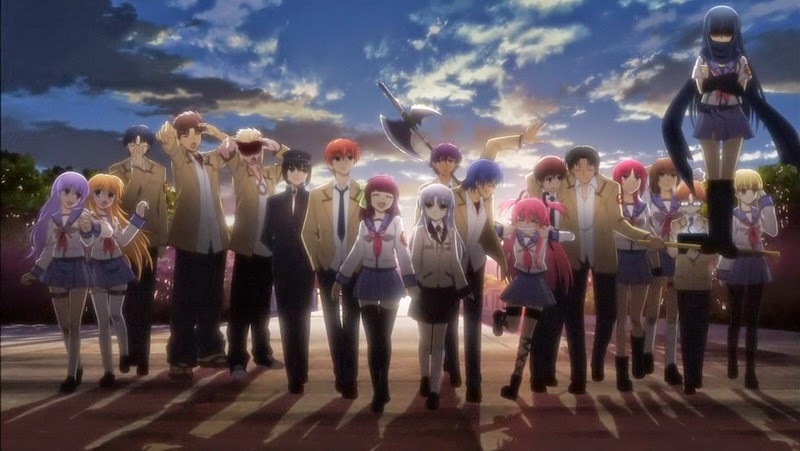 There are 3 or 4 characters in Angel Beats! (depending on if you count Hinata) that are clearly considered the "main" cast, and the rest all have equal standing with each other. There's no reason for Naoi to get more screen time than Shiina, or to focus on Takamatsu more than Yusa. Heck, even if you've seen the show multiple times, you probably don't even know who Yusa is, even though she's a crucial member of the SSS. She's the radio operator, if that helps. On the other side of the coin, we have The iDOLM@STER, which takes advantage of the fact that it has more episodes than characters and decides to devote at least one episode to every character, more or less. I don't mean that every character gets an episode all to themselves; I just mean that there is at least one episode for every character that was clearly intended to have that character grow in the eyes of the audience. Some characters can share an episode (like Ami and Mami), though any more than three in a single episode is pushing it. In fact, sometimes episodes are better because they're shared, or worse because they're not (Hibiki's episode could really have used a B-plot). Now, obviously it's not an entirely fair comparison considering that The iDOLM@STER has nearly twice the episode cound of Angel Beats!. So, let's look at another, more recent example of a 13 episode long show: The iDOLM@STER: Cinderella Girls. Yes, it is actually going to be 26 episodes, but as of right now, there are only 13. In the middle of the season, they realized that they weren't going to make it and cut the show in two to buy some time. Regardless, as of right now, the show is the same length as Angel Beats!. On top of that, it has even more characters than the original iDOLM@STER, with 17 main/semi-main. So, let's see how this incomplete show stacks up against a show that reached its conclusion. Angel Beats! reference - Yusa: blond on far right; Shiori: orange-hair on far left; Miyuki: purple-hair on far left. So how does it stack up? Quite well, actually. It's certainly not perfect, and most characters could use more development, but at the halfway point everyone has had their time to shine at least once. How did they pull this off? By sticking all of the idols into groups and giving each group a turn to have the spotlight. This allows them to develop up to three characters at a time, at least a little bit. This tactic means that, by the end of these first 13 episodes, I can recognize the names and faces of all 14 idols, and tell you what their quirk is (because every idol must have a quirk). That's certainly more than I can say for Angel Beats!. Seriously, I know nothing about Miyuki and Shiori. I had to look up what their names were, and I couldn't tell you the first thing about them (aside from the fact that they're in the band). Cinderella Girls will definitely benefit from the additional 13 episodes it has coming, but had it ended where it is right now, I would have to admit that it's more of a success than Angel Beats!, at least as far as cast management goes. Before I move on, I should make sure to note that I don't believe that every character needs a designated episode for their development to occur in. In fact, that can be one of the most clumsy and formulaic ways of doing things. For main characters especially, it's pretty much always better to give them an arc that takes place over several episodes or the entire series, where they mature little by little each episode. This can be harder to pull of with semi-main characters, which is why I don't mind giving them a designated episode. The iDOLM@STER and Cinderella Girls both give their Producer a series-long arc but never his own episode, and Angel Beats! does a good job of this for Angel, who never really gets her own episode either. Character arcs are significantly more fulfilling than one-off focus episodes, so if you can, give them an arc. 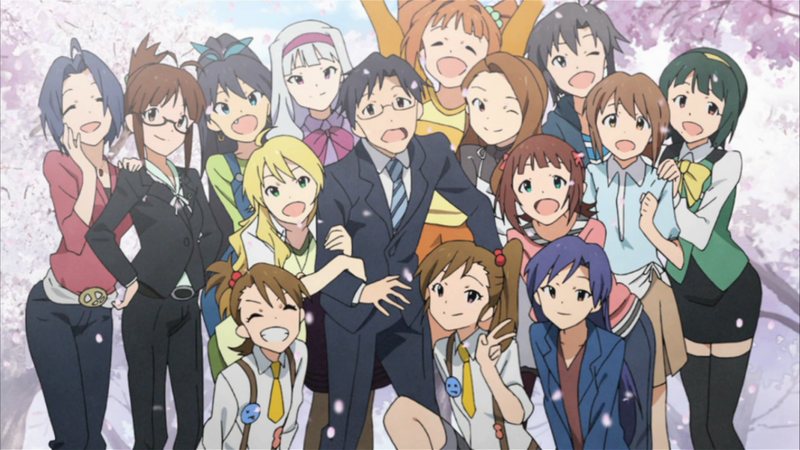 I changed my mind; here's the full cast of The iDOLM@STER (not pictured: the President). Another fascinating example of a small show with a massive cast is Girls und Panzer. 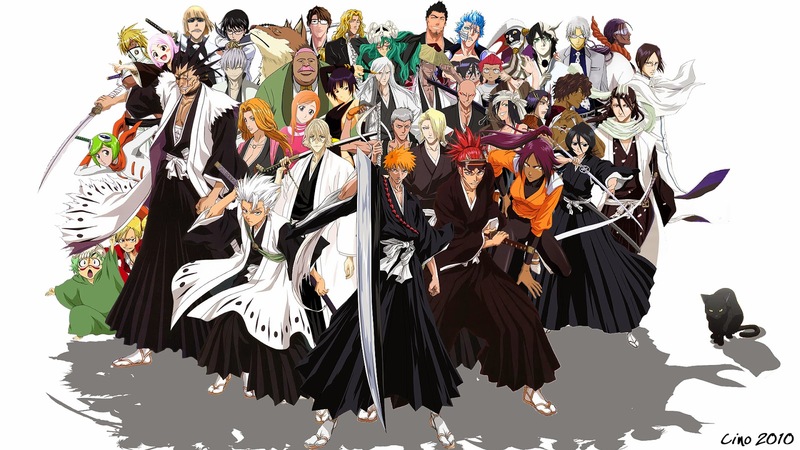 There are legitimately 32 characters on the main characters' team alone, all of whom are given names, personalities, unique designs, and a significant amount of screen time. There are a whole bunch of rival schools' students as well. However, the show is only 12 episodes long! There's no way it can pull that off, right? Well, no. It doesn't really. But it gives it its best shot, and at the very least, it doesn't fall flat on its face. It scrapes by through giving all of the semi-main characters really strong personalities, all of which are clichés, but that's not a problem: they're all played completely straight and with such high energy that you can't help but remember them. Plus, the show ends up grouping characters with similar traits into the same tank (i.e. all the history buffs, or volleyball club, or hall monitors), so it's easier to keep track of them all as a group. Girls und Panzer's character management is flawed, for sure, but it's still impressive what it manages to pull off given what it was playing with. You could contrast this with Bodacious Space Pirates, which is longer with a smaller cast but still manages to make most of the Yacht Club interchangeable. Let's just hit up one more example in the standard-length category: Shirobako. This show just finished, and I'd highly recommend it to anyone who's interested in how anime are actually produced. As a result of its subject matter though, there's a plethora of characters that must be fit into 26 episodes. The show starts out, and the viewer is immediately hit by a problem that's going to come back to haunt us later in this article: character shock. In the first two or three episodes, most of the important characters for the series are introduced to the camera, their name and job shows up next to their head documentary-style, and then we move on. Sometimes they show up again a little later, but heck if we remember who they are. That's character shock: too many characters introduced all at once, so that the viewer can't keep them all straight. Most new shows start out with a mild case of character shock, since everyone is new the the viewer, but Shirobako is on another level entirely. It does wear off after a while of repeated interactions, but even by the end of the series, I still couldn't remember who that character we were looking at was. Character shock should be avoided if at all possible, but if you absolutely need to introduce all those characters at once, make sure they stand out from each other and the others, and make sure to give them frequent, repeated screen time that reminds the viewer of who they are until they can be remembered. If you've ever noticed, in a good documentary they can stop showing the speaker's name every time they show up after a while, because the viewer will now remember them. There's probably a lot that documentaries can teach us about character shock, but I'm not well enough versed in them to give any tips myself. Alright, that was kind of long. We should probably move on to our other category of shows, the long-running ones. When you're working with hundreds of episodes, having enough time to develop each character is clearly not the problem. In fact, the problem is just the opposite: with too many episodes, it becomes easy for characters to get lost and forgotten in the sea of time between appearances. The two primary examples to illustrate this are going to be Bleach (done wrong) and Gintama (done right). Both are Weekly Shonen Jump titles, and both are several hundred episodes long. I suppose what's even more important is that they both have absolutely ridiculous character counts. I mean, it's just insane. I don't feel like spending the time to count them all, so I'm not going to give you a number, but trust me; they're both big, even when just counting the characters that could be legitimately considered recurring. Bleach. This isn't even all of them, if you can believe it. I watched both shows the same way: daily quotas of episodes that I forced myself to meet over the course of an entire summer. Not the same summer, mind you, but the same system none the less. If I'm going to be perfectly honest, it was much easier to do that with Gintama, and I actually finished it early because it was so good that I watched more than my quota on many a day. Bleach was tough, but I did manage to finish it on schedule. Hmmm... I seem to have digressed. Regardless, the point I was trying to make is that I watched both of them pretty much as quickly as I could, so I really shouldn't have managed to forget about any characters (but I did, at least with Bleach). So why did I forget about some of the Bleach characters? How does that even happen? Well, I actually got the impression while watching that the author may have forgotten about them himself. Or maybe the director. I haven't read the manga, I don't know if it's an anime specific problem. Take Nell, for example. She has her fight, we find out about her past, she gets knocked out and is healed by Orihime, and then... nothing. I'm pretty sure she never shows up in the anime again. There's no closure; we don't even see her wake up, I don't think. Even if we do, the fact that I can't remember it happening is a pretty strong indication that something was handled wrong. On the flip side, we have Gintama. More specifically, we have the character of Hedoro, a giant green demonic-looking alien. No, I'm not going to even try to explain Gintama's premise. Hedoro is introduced in episode 47, and I'm pretty sure that he doesn't show up again in any significant fashion until episode 220. Yup. Over 150 episodes later. In fact, I think he's only really in about 4 episodes at all, two of which are actually a two-parter. But did I ever forget about Hedoro? Oh no. No, not even a little. Why did I remember a tiny role from Gintama, but not a key player from Bleach? I'm pretty sure character design isn't a factor, since Bleach has some of the most unique designs out there. So what could it be then? Simply put, I think it's cameos. Gintama is mostly a comedy anthology, so it can get away with things that other shows can't, like ignoring continuity or breaking the fourth wall, and that's the source of some of the cameos, to be sure, but not all of them. I'd guess that the main source of cameos is the opening and ending song animations. Almost every OP (and some of the EDs) features nearly the entire cast in some form or fashion, even if it's only for a couple of frames. Those frames are enough to remind the viewer that this character exists and has this particular quirk, and to make them hopeful that they're going to come back soon (I'm looking at you, Sakamoto). And they do. It may take hundreds of episodes, but the viewer will be eagerly waiting the entire time. When the character does show up, the viewer won't be confused, wondering who this person is; they'll be excited, because their patience will have finally payed off. Gintama. Hedoro is the giant green guy on the far right. You may want to use the full version of the image. Of course, opening and ending animations are something that's fairly unique to anime, so other mediums need other strategies. The "Previously On" recap at the beginning of an episode that calls back to significantly older episodes is fairly successful for Western tv shows, since it gives the viewer some time to remember the details of the important scenes the character was in. It's really only a fix for the episode that they return in though; it doesn't do anything to help remember them while they're completely out of the story. Still, you could always give them in-episode cameos, such as a photograph lying around, or having them be mentioned in a background (or foreground) conversation. Sadly, I don't have any better solutions right now. This is a problem that you'll have to work on without my help. I haven't watched too many long-running shows, so I'll close by briefly covering the others that I have seen, starting with Naruto. It's the show that I've been watching for the longest, since I've been watching on a week-to-week basis for over four years now. It's fared slightly better than Bleach as far as recollection of characters goes, though I'm not entirely certain why. All I can decisively say is that, once again, it has nothing to do with character designs. The designs in Naruto are far more homogeneous than those in Bleach. In Naruto, most everyone is a ninja, wearing very similar clothes. Even their hairstyles and colours aren't too crazy. It's much more grounded, yet I can remember the characters better. I'm going to chalk this one up to character shock again. I said it'd come back to haunt us, and it haunts Bleach like Patrick Swayze haunts pottery wheels. While Naruto introduces characters in groups of two or three mostly, Bleach brings in batches of 10 or 20 all at once, making it way too hard to remember them all. I've heard that the author's writing process is to first design a character, and then write a story around the design, so I guess it makes sense for him, but it's certainly not easy for the viewer to keep up. What's this? The picture has nothing to do with the text around it? Shut up. 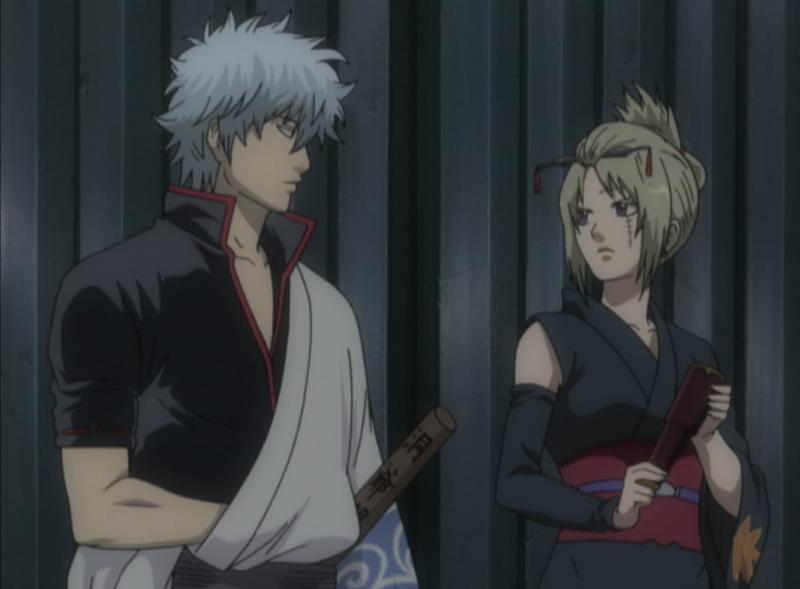 Gintoki x Tsukuyo is best pair. Legend of the Galactic Heroes has quite the character count on both sides of its conflict, but it gets pretty much everything right. It manages to avoid character shock by introducing people slowly over the course of the entire series, and it keeps the viewer from forgetting about characters by checking in with each of them fairly often, just to make sure that we remember what they're up to. Inuyasha manages to avoid the problems discussed altogether by just not having a large cast. For a series as long as it is, it's impressive how small they manage to keep the cast. I haven't actually watched the Fairy Tail anime, I've only read the manga, but I'll use it as an example anyways. Simply put, it's a mess. Aside from the main characters, I found it so hard to keep track of who was who, especially since there was a time skip. Unfortunately, I can't say how much of this was caused by the writing and how much was from my unfamiliarity with manga (there's no colour! how am I supposed to keep them all straight with just shapes? ), but it was not easy. It's hardest when enemies from previous arcs show up again, especially when they've become good. I read the author's afterword to several volumes, and he's constantly saying things like "yeah, I don't actually know what's going to happen next yet. I'm just going with the flow" or "there wasn't really any reason for a time skip. I just always wanted to try one!" so I'm not very surprised. I guess it's about time to wrap this up. Like I said at the beginning, this isn't a post to give you all the answers. I'm just trying to point out some common problems, and maybe some things you can do to try and fix them. Or, if you're not a fiction writer yourself (welcome to the club), I hope that you'll be able to better understand what exactly it was about that show you watched the other day that felt just a little bit off, but you couldn't quite put your finger on why. That happens to me all the time, so I hope that this post has helped ease that problem for you, at least a little bit. Thanks for reading.